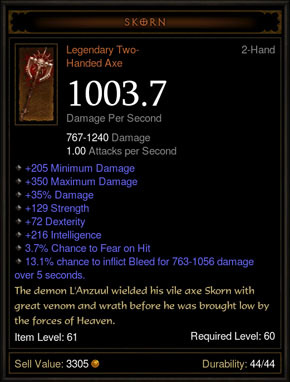 Let me start off by saying the Diablo 3 1.0.4 patch is going to be a major improvement to the game. A few features that this patch will include (and I will go into more detail below) are; System changes (the way the game works), legendary buffs (item buffs for the legendary items), character improvements (skills etc.) and the Paragon System. The 1.0.4 patch/update was pushed out on the 20th Aug 2012 and was available for EU servers today certainly. We sincerely hope that this evens out the game play allowing players to progress through the game at a normal rate and not have to depend on the Auction House to buff your character enough to proceed. 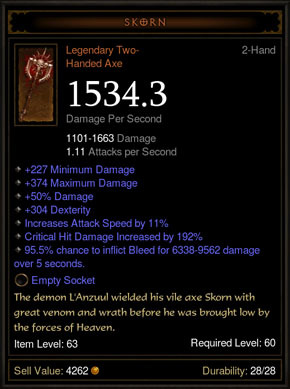 The Paragon System is a new leveling system after you reach the maximum level in Diablo 3. So once you have reach level 60 you now have another 100 levels that take place. These levels grant bonuses such as, core stats like as Strength, Dexterity, Intelligence, and Vitality in similar amounts to what you would gain from a normal level while reaching level 60. As well as 3% Magic Find and 3% Gold Find. This magic find and gold find totals up to 300% magic find and 300% gold find. This is the maximum percentage cap anyway, meaning there will be no need to have magic and gold find gear anymore, no more gear swapping during battles. This alone is a major improvement to the game. Leveling up will be the same as before, the amount of experience needed to level up is unknown at the moment. This also being said every 10 levels your character icon in game will change as well. A good example of this can be seen below along with how the experience bar will look as well. Let me make the character improvements short and snappy. Basically they have just improved nearly all the skills so that you have a more a of a choice to choose from. They felt that there was too much of a specific build and certain skills that you felt that you had to use and therefore ignored the others. On the other hand they felt like some skills were just not what people were looking for, as they either did very little damage or they were just completely useless. Now let me just explain what I mean when I say System Changes, this includes item cost of repair, mob skills, mob life, the way the game functions pretty much. So firstly let me point out that they have lowered the item cost when repairing. However this only applies to high end gear, but improvement nonetheless. They have lowered it by 25%. Although it isn’t a dramatic decrease its defiantly better! Next thing on the agenda is that they are shrinking the gap between normal mobs and elite mobs. The normal mobs are being slightly bumped up while the elite mobs are being decrease. This includes health and damage. This also includes the annoying stats they might have, such as fire chains and shielding. They are both being knocked down, de-buffed you might say to either do less damage and/or not last as long (shortened duration). A few minor things they are getting rid/modifying of is that when you join a game your magic and gold find is averaged; now it’s completely up to your own stats. They are also modifying the health multiplier mobs gain when new players join, before depending on how many people joined and what mode’ you were in the stat changed. Now it’s at a fixed rate of 75%.